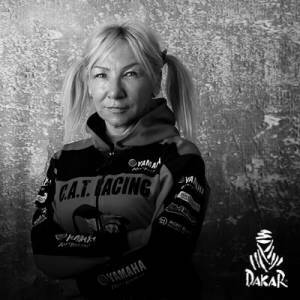 Camelia Liparoti is on her 10th Dakar, this year racing a Yamaha YXZ 1000-R side-by-side. Although she’s racing a side-by-side vehicle in the 2018 Dakar, and not a motorcycle, the story of Italian born Camelia Liparoti is worth telling. With 9 Dakar’s to her name, Camelia has become known for her dogged determination, tenacity and toughness in facing what the Dakar can throw at you. She is also known for her blonde pigtails, her love of the colour pink, her cheeky nature and her tiny stature. And when we say tiny we mean it – Camelia stands just 1.56 metres tall and weighs only 47 kg. But don’t be fooled by the cute girly appearance! Christophe Barriere-Varju (Dream Racer), who has raced alongside Camelia a number of times, says that she is one of the toughest competitors he has ever encountered. Camelia was born in Livorno in the Tuscany region of Italy. She moved to Chamonix in France – a resort area at the base of Mont Blanc near the junction of France, Switzerland and Italy – to be close to where she was working as a sports photographer. She is also a professional skier, extreme ski fanatic, and an accomplished mountaineer having climbed Mont Blanc in 2002 and a peak of more than 6000 metres in Tibet. “I like skiing, I have the mountain foot and I could not live without the mountains,” she comments. Camelia has been fascinated by motorsport since she was a child. She discovered the Dakar rally ten years ago during a report and had the opportunity to take a quad for a test run. It was the revelation: slides, speed and reading of the field are as much in common with skiing. Her first attempt at the Dakar was in 2008 – the year it was cancelled due to the threat of terrorism – so Camelia never had the chance to compete that year. She returned the following year with a quad but the Dakar did what it does to rookies so often and she failed to finish. Once again the tenacious Camelia returned the next year (2010) and completed the event in 13th place, and she has not missed a year or finished out of the top 15 since. Her best result was in 2012 when she finished in 9th place. 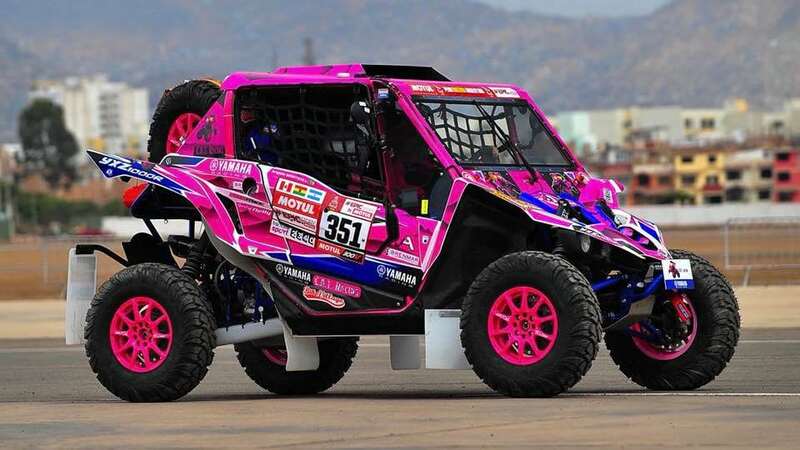 For her tenth Dakar, Camelia is turning a page in her career and shifting to the side-by-side category in a Yamaha YXZ 1000-R.
Four times Dakar competitor Christophe Barriere-Varju, who has driven the YXZ 1000-R in the presence of American champion Corry Weller, says it is a highly competitive machine, well suited to the conditions and a perfect choice for Camelia to begin the transition to cars. In her first outing with the machine in the Merzouga Rally in Morocco, Camelia finished 2nd in a field of 33. “I like it a lot because it’s not a car, we’re not locked up. It’s just a big quad”, Camelia says of her new ride. Beyond 9 consecutive Dakar’s, Camelia won 6 world championships from 2009 to 2014. You can follow Camelia’s progress in the 2018 Dakar at www.dakar.com and also on her Facebook page.